If you and your sweetheart are thinking about exchanging vows on a tropical beach or exotic location, you might be curious as to which wedding destinations are most popular aside from Las Vegas. According to Bud Carmichael, the founder of DestinationWeddings.com, a travel agency that helps couples plan their weddings away, these are the top destinations. They appear in order of popularity. South of the border, Mexico entices couples with its warm, sunny weather, colorful culture, extensive coastline, spicy cuisine, and a wide choice of accommodations. Thanks to a huge number of all-inclusive resorts along some of the country's most beautiful coastlines, beach weddings are immensely popular. To the west, Los Cabos on the Baja Peninsula is one popular option, or consider the beautiful Rivera Maya on the eastern coast facing the Caribbean Sea. Of course, you'll also need to take care of the legal aspects of getting married in Mexico. Read more about the requirements to obtain a marriage license abroad. Lush Jamaica has beaches, waterfalls, and mountains to explore. Add in more all-inclusives than anywhere else in the Caribbean and a reggae beat, and it's no wonder this island is so popular with couples who want a destination wedding followed by a beach honeymoon. Jamaica also makes it easy for couples, even ones who are citizens of other countries, to hold a wedding here. There is only a 24-hour waiting period required before you can get a marriage license. Island wedding planners and resort wedding coordinators are experienced in helping couples deal with the paperwork. But if you want to handle it yourselves, you will need to apply for a license at the Ministry of Justice in Kingston. No blood test is required, but you will each need a certified copy of your birth certificate. If either or both of you is widowed or divorced, those official documents will be required as well. Sandals Resorts, which has more all-inclusive properties in Jamaica than anywhere else, has made planning a destination wedding from a distance easy. Thanks to the company's "Aisle to Isle," you can sign up for a free webinar to conjure the wedding of your dreams. Couples who want to honor the African-American tradition of jumping the broom will have no problem integrating it with their Jamaica wedding ceremony. One of the larger Caribbean islands, Jamaica is ringed by sandy beaches and is a popular place to honeymoon for several days after the wedding. The advantage of choosing a Sandals Weddingmoon is that you can stay at one of the resorts and have access to the restaurants and facilities of the others, so you won't get bored of the venue that you choose. During a Jamaica destination wedding with family and friends, no one is limited to just lying on the beach after the ceremony ends. The Blue Mountains of Jamaica are where the world-famous coffee is grown, and you can arrange to tour a coffee plantation or tour the national park on the mountain. Couples who like to get wet have a variety of experiences to look forward to. There's Mayfield Falls and Dunn's River Falls, reveling in the warm waters of the Blue Lagoon, snorkeling at Montego Bay Marine Park, even rafting on the country's longest river, the Rio Grande. Note: Since many couples visit Jamaica as a port-of-call during a Caribbean cruise, Half Moon Resort in Montego Bay can even help to arrange a wedding while a couple is on shore. East of Jamaica and west of Puerto Rico, the Dominican Republic shares the island of Hispaniola in the Caribbean with Haiti (and somehow the symbolism of sharing makes it a logical place to stage a destination wedding). Hispaniola is also the second-largest island in the region. Wide swaths of beach and powdery sands along 900 miles of coastline are among the attractions of the Dominican Republic, and the country also has a large selection of all-inclusive resorts that are comparatively cheaper to stay and wed in than on other Caribbean islands. 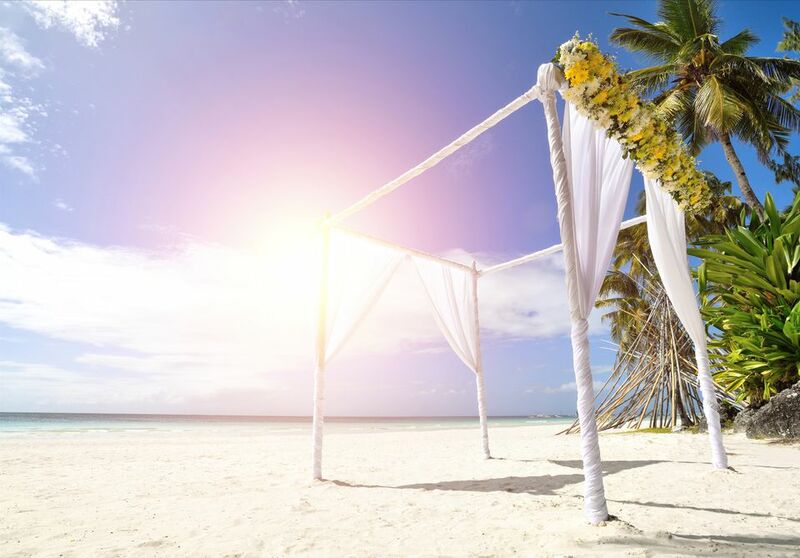 Isolated enclaves in Punta Cana on the eastern tip and other places on the island's southeastern side are the most popular spots for couples to hold a destination wedding and continue with their honeymoon. In order to have a legal wedding in the Dominican Republic, couples must do a bit of pre-planning. Prior to arrival in the Dominican Republic, American citizens must get permission to marry from the American Consulate in Santo Domingo. The document you receive then must be presented at the Dominican Consulate along with your birth certificates and any divorce papers (wait until ten months after a divorce to apply). Once permission is obtained, couples can marry in a civil ceremony, which can be officiated by a judge or notary public. Additionally, Dominican law requires that banns be published prior to the ceremony. At Dreams Resorts' locations in the Dominican Republic, in Punta Cana and La Romana, the all-inclusive brand ought to be considered by couples planning a destination wedding that will include guests with children. There's an Explorers Club for kids between the ages of 3 and 14 as well as a separate core zone for teens. And travelers with very young children can arrange for babysitters. At the high end of the spectrum, the largest resort on the island, Casa de Campo covers nearly 7,000 acres and has had experience in ushering many, many couples into matrimony on the premises. Venues include the beach or a cliff overlooking the Caribbean Sea or Altos de Chavon, the charming hilltop Mediterranean village on the property. Casa de Campo offers off-the-rack ceremony packages for two that all include the services of an on-staff wedding coordinator, the bridal bouquet, boutonniere, and a memento to help treasure the memory. Where things start to get pricey are the reception options, which are comparable with fine hotels in the United States. (Cost-conscious couples may simply want to elope here and celebrate à deux with a gourmet dinner at one of the resort restaurants after their vows. The beautiful Bahamas, just off the coast of Florida, offer couples everything from 24/7 excitement to total laid-back bliss, depending on whether they opt for developed Nassau, Freeport, Paradise, and Grand Bahama Island or one of the low-key Out Islands. You have more than 700 islands of the Bahamas to choose from, although hotels with destination wedding services are only available on a handful. All of the islands of the Bahamas are ringed by coral-sand beaches, which makes it a prime spot for beach weddings set against clear, clean, aquamarine waters. One advantage of a destination wedding in the Bahamas is that it is close and easy to reach from the continental United States. Flights from Miami take less than one hour. The other advantage is that for couples who want a relatively long and event-filled celebration, there's plenty to do. Whether guests enjoy swimming and sunning, snorkeling and diving, fishing and sailing, shopping and spas, clubbing and gambling (or any combination of those activities), places are accessible and plans can be easily arranged. Although the major destinations within the Bahamas are Nassau/Paradise Island and Freeport/Lucaya on Grand Bahama Island, some of the smaller Out Islands now feature exceptional hotels that couples are also choosing to be married at. Sandals Royal Bahamanian Spa Resort on Nassau is an AAA Four-Diamond winner and also boasts its own island. Sandals Emerald Bay on the Out Island of Exuma was originally flagged as a Four Seasons resort, so there's quality in its bones. When Sandals took over, they added romance. Other options include the vast ​Atlantis Resort & Casino, which has expanded into a virtual water wonderland with Aquaventure, a mile-long river ride on inner tubes that includes rapids and a 120-foot water slide complex with three slides. Sophisticated couples can make use of all the facilities and retreat to Cove Atlantis when the crowds get to be a bit much. Long known as one of the Bahamas' most upscale hideaways, One&Only Ocean Club on Paradise Island in the Bahamas is where Cindy Crawford and Rande Gerber married and popularized the destination wedding trend. It's a long flight to Hawaii from just about anywhere, yet couples flock to the state's gorgeous islands in order to have a memorable destination wedding in one of the most beautiful places on earth. One popular option is the ​Hilton Hawaiian Village in Honolulu, Hawaii. The property contains the first free-standing, resort wedding chapel in Waikiki. It is surrounded by lush landscaping, romantic waterfalls, and a lagoon. Couples who want to get married in Hawaii should familiarize themselves with how to apply for a marriage license in Hawaii. As a United States territory, it couldn't be easier to travel to the United States Virgin Islands; no passports are necessary. Yet, surprisingly, it's not quite as easy to marry here than on other Caribbean Islands. It's necessary to first submit an application for a wedding license (download one here first). Once the Superior Court of the Virgin Islands receives your completed, authorized application, an eight-day waiting period begins before you can marry. Once you've taken care of the paperwork, you can focus on the destination wedding itself. The USVI consists of three major islands, St. Thomas, St. John, and St. Croix. In both tone and surroundings, the islands vary tremendously, which makes an island-hopping wedding or honeymoon great fun. There's also the opportunity for novelty: Couples can get married underwater, charter a yacht for their entire party to sail, or rent a villa for the duration. Of course, religious venues that include churches, temples, and mosques can be reserved. Naturally, beach weddings are popular. The most built-up and commercial of the USVI destinations, St. Thomas is also its transportation hub. Flights from the continental United States land at Cyril E. King Airport in Charlotte Amalie, which is also the port where cruise ships call. For couples who are shoppers, the streets of Charlotte Amalie are filled with shops selling everything from glittering jewels to state-of-the-art cameras. And thanks to the islands' territory status, visitors are allowed to bring back more duty-free booty from the USVI than from any place else. Just as spectacular is Magens Bay on St. Thomas, one of the most photographed beaches in the Caribbean. Its white sands stretch for nearly three-quarters of a mile. Paddle boats, kayaks, and sunfish can be rented by the hour here. Couples have the widest choice of accommodations on St. Thomas. The Ritz-Carlton is at the top of the list. St. Croix, 40 miles south of St. Thomas, is the largest of the USVI. Two hotels that have been hosting weddings and honeymoons for generations include The Buccaneer and Carambola Beach Resort. St. John, 3 miles from St. Thomas, is a vast nature preserve that remains the most underdeveloped of the USVI. Two-thirds of the island consists of national parkland, and camping is permitted here. On the other end of the spectrum is the luxurious Caneel Bay Resort. For couples who have family and guests at disparate ends of the economic spectrum, a destination wedding can offer those who can afford the best nights at Caneel Bay and those who are limited in funds (or just really love the outdoors) the opportunity to overnight in tent cottages. Other accommodations throughout the islands consist of beachfront resorts, hillside inns, and campgrounds, all surrounded by tropical beauty. As for activities, they primarily center on water sports. At Coral World Ocean Park you can go on a scuba adventure; it's kind of a scuba that anyone who can wear a snorkel mask can master. A couple of outfits offer sunset cruises that include a beach barbecue, which offers an innovative first (or third) night dinner for wedding guests. Dry Aruba, south of the hurricane zone, welcomes wedding couples year-round. Its clean, wide beaches beckon lovers by day, and its dozen-or-so casinos keep the action going till the wee hours. Rarely does a day without sunshine occur in Aruba. Add to that trade winds, gorgeous sunsets, and year-round average temperatures of 82°F, it's unlikely that your destination wedding here will be a rain-out. Aside from brides not having to worry about bad weather (and feeling confident even scheduling a wedding during hurricane season), the big draw in Aruba are the beaches. Wide, long, glistening and lapped by warm, turquoise waters, the extensive sandy stretches provide beautiful natural venues for a ceremony on the sand. The Ritz-Carlton Aruba - Steps from gorgeous Palm Beach and ten minutes from Oranjestad, this luxurious resort is an elegant location for a destination wedding. Hyatt Regency Aruba - ideal for beach lovers, the Hyatt offers direct access to wide, clean Palm Beach. One of the romantic touches it can offer is a beach dinner reception lit by candles, where everyone gets to kick off their shoes and dig their toes into the cool sand. Renaissance Aruba Resort & Casino - offers both a city and an island experience. Part of the hotel is located in Oranjestad, the capital of Aruba. There's also an ocean-side section. Couples who stay in either part have access to offshore Renaissance Island, reached by the hotel shuttle. Aruba Marriott Resort & Stellaris Casino - also on the beach, the eight-floor Marriott has a variety of restaurants and one of the island's most popular casinos. Couples who'd rather cocoon themselves in a child free environment will appreciate that low-rise Bucuti Beach on Eagle Beach is serene, classy, and for adults only. It's quiet here and no place to stage a blow-out party. But mature adults who might prefer eloping with no one but the officiant and witnesses around can have the low-key wedding of their dreams here. Since Aruba is popular with visitors from Europe, Eurostyle hotels should also be considered. Amsterdam Manor Beach Resort is laid back, relatively inexpensive, and across the street from Eagle Beach, one of the prettiest stretches of sand anywhere. Exotic Fiji, with its gentle culture and castaway-island charm, is the choice of couples who want an unusual getaway-from-it-all wedding destination. Traditional Fijian weddings can include the delivery of the bride in a boat and ceremonial dances in costume. Historic and romantic, Europe's great cities and small villages alike provide unforgettable settings for destination weddings. However, many countries within Europe have stringent requirements for marriage that can include a long residency period. For this reason, many couples who want a destination wedding in Europe first marry at home and then have a symbolic ceremony in Europe.